April 28, 2006 1000 PST – (FTW) - We collaborated with Black folk through the only institution over which they still retain control—the Black church—that is also the locus of African American community organizing. That is why it was disrespectful to say, “I don’t do religion.” I marked a fundamental failure to grasp that some of us are citizens, and some of us are subjects. That is why we need training in anti-racism, to learn to recognize white privilege, even among those of us (like some Latinas) who are only just provisionally granted the status of “white” by not being Black. At Macedonia Baptist Church in Ocean Springs, we heard survivors speak out, and we were treated to singing, individually and from a youth choir. Then they fed us. Barbecue. The city refused to let us camp in the grounds, so we had to convoy to another church, New Life Baptist, in the country along Highway 609, en route to bypass the shattered Bay of Biloxi Bridge. We passed a night sleeping indoors, on the floor of a gymnasium. Baptist (L-R) Camilo Mejia, Dennis O’Neil, Jeri Reed. CNN showed up at New Life Baptist before we left. We’d dealt with them without much incident so far, but when we prepared to kick off in Biloxi, our size and composition caused them to swarm on us. And they were not friendly. We’d never successfully negotiated a permit with them, but we’d already decided to march. We rolled in like invaders, 35 automobiles now, two of them packed buses, and we drove in circles to pull the great queue into a parking loop that stretched around a block near the West end of the Biloxi Bridge. 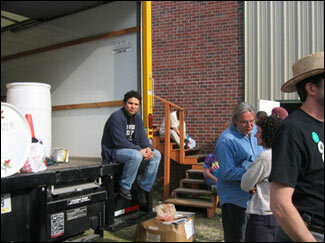 As the vehicles disgorged more than 200 people (Grumble was counting heads at breakfast. ), the cop cruisers and motorcycles growled in among us—a lot of them. But we were a lot more. They wanted to know who was in charge, a funny question given how we were operating. Paul, Vivian, and I went to talk with them, and they were basically telling us to push off. When that was overheard among the “troops,” the murmurs of rebellion began. “If we walk on the sidewalk, will they arrest us for that, too?” That was a rhetorical question. The sidewalks along the Biloxi coastline, where we were, Gulf of Mexico on one side and pure ruin along the other, were a memory…like the homes that were there before. But the cops caught the scent of rebellion, too. Did they want to arrest Iraq veterans, Vietnam Veterans, military and Gold Star families? While they were attempting to retain their authority after ordering us to leave and getting no response, Lovella Calica—a young IVAW staffer—started blowing soap bubbles past the stern visages of our vets. They would threaten to two one car, and they would give Ann Wright a ticket for blowing her horn (“excessive noise”), but these spiteful reactions could not erase the fact that we had just successfully occupied Biloxi, Mississippi. When we stopped for lunch in Gulfport near a wrecked miniature golf park, Inigo Gilmore, a BBC documentarian on the march with us was interviewed by the local ABC affiliate for the nightly news. “I’ve reported from all over the world,” he said. “And in all those places, the only place I’ve seen police hostility like I saw in Biloxi today was in Apartheid South Africa. It was disgraceful.” Obviously, these folks did not work for FOX. 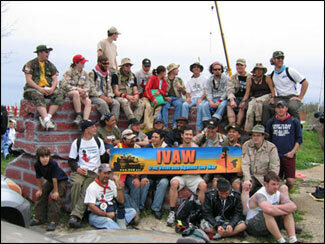 At the mini-gold place, we took a series of fine group photos of the IVAW crew. The end of that day’s journey would land us in Long Beach, again camping at a semi-rural Black Church, Mt. Pilgrim Missionary Baptist. During the night prior, one Iraq vet had started awake crying out with nightmares, until his comrades calmed him down. 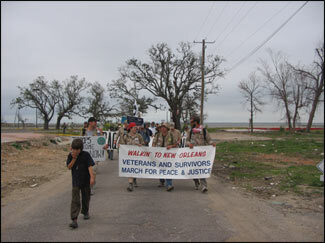 Today, as we plodded through the rubbled urban terrain of Biloxi, Gulfport and Long Beach, these same vets would remark about how similar in some respects this was to Iraq. The relentless devastation and the long distance had sobered us to some extent. Some of us were equally sobered by passing a broken historic monument—the home of Jefferson Davis, President of the Confederacy. When we shuttled inland to the church, just ahead of the Long Beach Police (called by an irate white woman incensed by our antiwar signs), we unloaded and set up, almost mechanically now—we were getting good at it—and people coalesced again into knots where they healed the psychic lacerations of the day’s journey with friendship. There were services that night, partly to celebrate the pastor’s anniversary with the church, and partly as a welcome, and again, a fine home-cooked meal. We were all taking on that outdoor aspect—gritty fingernails, shaving stubble, sun-baked faces. We came to life each morning like a flower opening to the sun, steadily and gradually. Grumble’s cowboy-coffee container was a gravitational field that drew us in like particles from the multilucent peaks and domes of our tent-towns. With the first hot sips, people holding their bodies tightly against the chill shared their little experiences with fire ants, cold, heat, or something dislocative they might have seen the day before, and healed each other with laughter. Then there was food and the resumption of conversations from the day before. More laughter. Occasionally, some tears, whereupon one, two, even three people might embrace. When one of the Iraq vets shed a tear, six, seven, or eight would fold around him…or her…as if their combined heartbeats and heat would drive out sadness and distress. And the walking. There is nothing that compares to walking, in my opinion, for stimulating the circuits in one’s head; something about spinning the earth along under your feet like a log roller that creates a kind of muscular background music and the scenery that goes past becomes a spiritual setting. After a while, when the blisters and sore metatarsals and general fatigue take form, anything grandiose that might have contaminated one’s consciousness is trimmed away with the knowledge that in the end, it all comes down to bodies—to the limitations of bodies, the capacities of bodies, the caring for bodies, the recognition of bodies. In a large group like this, from 120 to 300, pick your day—it fluctuated—one talks while s/he walks, listens, collects and offers little scraps of acquaintance that accumulate into nascent friendships…contextualized by that body-knowledge, by the rhythm of walking, by the rolling of the earth under our feet in the same direction, and by the steady stream of change that flowed past us. Even when that scenery is of loss and disorder. Especially when that scenery is of loss and disorder. 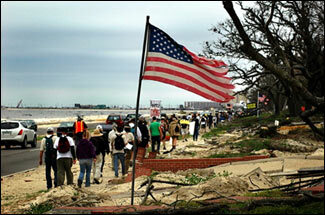 On the 17th, we started with a walk through Bay St. Louis. When we announced that we would walk without a permit, our participants cheered. That was what we were becoming. We were no longer a movement on the defense. The police showed up, and Ann Wright and I chatted with them. We asked the senior officer about his experience of the hurricane, and he—like all of the survivors asked this question—could not resist telling his story. 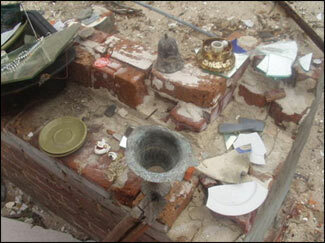 His house had been totally destroyed, though his family had evacuated. He had to remain on duty afterward and swallow his grief. We promised him we would not block the street, and he asked us to move the cars at the end of the broken-bridge roadblock to prevent an accident. We accommodated. As we were about to take off, he asked us to walk around the first block before we headed down. This was where the hardest edge of Katrina’s eye had ground through. We walked the circuit, and it was Hiroshima writ small. We subjected ourselves to these scenes by pressing our feet into them. And to bear them, we would hold each other up with words, with looks, with just being near, and with singing. There was also dancing. We danced down the Gulf Coast. Ask anyone who was there. We danced in Prichard. 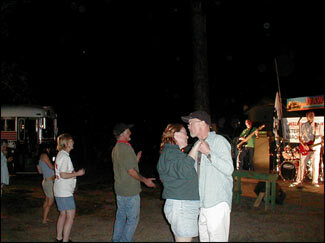 We danced along the highway during breaks when the Iraq vets would pull out their drums. We danced in a relief worker camp and in a soccer field. 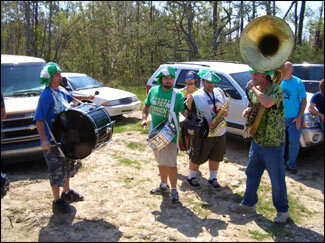 We danced down the streets of Slidell LA to drums, a tuba, and a tenor sax. 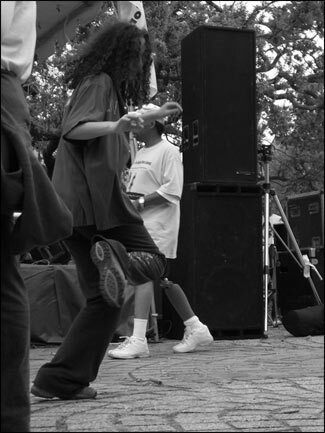 We danced in Congo Square. We swayed and clapped to the sounds of church choirs. It’s how we celebrated each other, our solidarity. We laid flowers below old photographs of the dead. We juggled. We ate gumbo and peanut-butter-jelly sandwiches. We talked to people with cameras and camcorders. Traffic management and preparation to simply move became monstrously complex. But even that “glitch” suddenly revealed itself as strength. I hated directing that traffic, but when I looked back down the shoulder of the road one day, and all those cars were lined up, it was apparent that we were showing our strength. We were a train, a peace train, and we started taking towns by simply moving in…cops were stunned and baffled, struggling to retain some semblance of control and authority, and we let them have it. Did you get that? We let them have it. Where was the power then, eh? Every glitch, every last minute change, every late decision to follow some suggestion from a marcher or a local survivor became something surprising and wonderful. We knew where we wanted to begin and end, but the route was—I’ll say it again—pure jazz…improvisation, with every marcher playing her or his part. So those that came were young and old and everything in between, and black and white and everything in between, and rural and urban and everything in between, and northern and southern and everything in between, and even male and female identified along multiple continua. But there was a common demographic…a personality demographic, or maybe a character demographic, held in common. Everyone who came was willing to try something none of us completely understood. Everyone who came was willing to drop everything to do something they sensed might be important. Everyone who came was willing to accept risk. And everyone who came was willing to accept responsibility. That’s what none of us who organized this could see clearly until it happened, because the phenomenon we just experienced was a collective dynamic that was the qualitative offspring of the quantity of people who have this common character. I don’t know just what we did…except to put a couple hundred people outside their familiar surroundings, onto the margins of the grid, and move them cross country like a mechanized battalion through this incredibly strategic place. I never grasped this fully—being so busy trying to make the moving parts run—until Slidell. 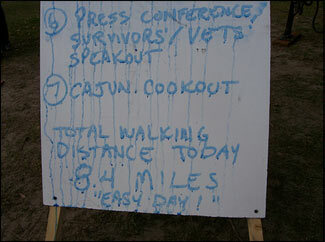 On March 17th, we entered Slidell. That crazy youth quartet of street jazz players turned us into protest-Mardi Gras. The noise pulled the populace out into the streets, and in Slidell—a place Klansman David Duke once claimed as a base, we were embraced as never before. 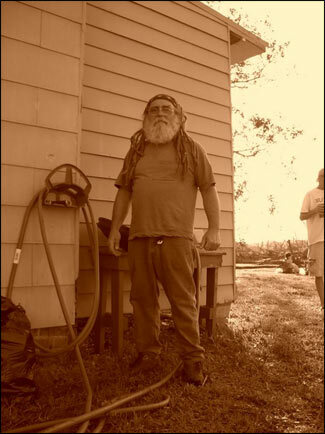 Horns honked, peace signs flashed, and people came out of stores and onto porches with broad smiles and friendly waves. 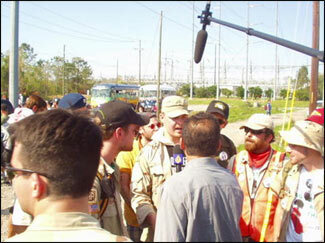 At the end of the march route through Slidell, Al-Jazeera waited, and our Iraq vet “kids” (I call them my kids) flocked to give interviews, hoping that this way they might get heard by the GI’s still in Iraq. Virginia Rodino, from Baltimore, our Media Coordinator, had been held up by her job and joined us on March 16th. The Al-Jazeera hook-up was one of her many little coups. In the initial run-up for this event, no one was more committed to its vision or invested more of her spare time, outside of those actually organizing in the Gulf Coast. The Slidell reception did not stop with a marching jazz band and Al-Jazeera, however. 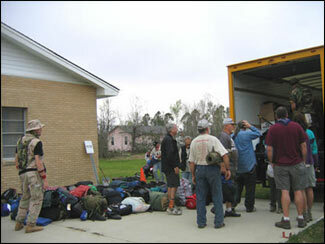 There is a woman who runs the relief worker camp at Bayou Liberty, just outside Slidell, who came from Oklahoma after the hurricane and stayed. Her name is Niki Wilson. Niki fretted during the planning that she hadn’t crossed her organizing T’s or dotted her I’s. 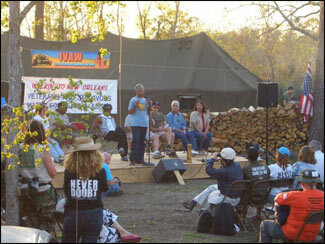 But when we got to Bayou Liberty Relief’s camp, there was a Cajun feast in progress, a whole string of survivors prepared to speak to us and the press, and a local bar band. 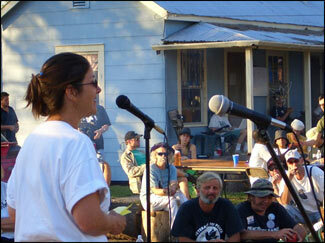 Niki also coordinated the port-a-potties for the Louisiana portion of the march. 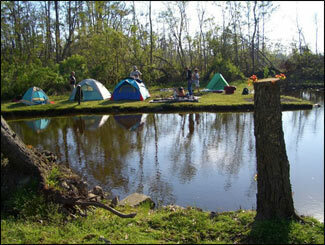 We pitched more than 120 tents there. Bayou Liberty is gorgeous, even in the wake of the hurricane. There were already two functional bunkhouses and two teepees. By 5 PM, we had begun the survivors and veterans speak-out. One man told a harrowing story of using a johnboat to escape the flood and finding 34 bodies floating in a flooded nursing home. He fell into tears as he tried to tell this story. The stories of FEMA’s foot-dragging and racism were legion. We heard from Black, white, and Native. During the veterans speak-out, Tina Garnanez, a Navajo veteran from New Mexico told of her experience as a medic in Iraq, and how treating the wounded just reminded her again and again of the occupation of Indian land. She also talked about her “other” status as a lesbian in the Army. Not even our oldest church-women batted an eye. Everyone here knew what it was like to be the “other.” And together, we were… well, we. Family. Then we ate. Then the music played, and the stars came out, and the moon rose. And we danced.